I saw a commercial that was advertising that it’s pre-made frozen chinese entrée was faster than getting take out. This made me pause. What if I could make a healthier alternative that was faster than their 30 minute deadline. Wouldn’t that be better? So, I timed myself. Oh yeah…22 minutes, 46 seconds from raw materials to plated “take out”. I really didn’t even have to rush that much. Heh. Season chicken with garlic and black pepper. Heat a skillet or wok to medium. Cook chicken until cooked through. While chicken is cooking combine water, flour, lemon juice, soy sauce and jello in a bowl and set aside. Once the chicken is cooked add the water chestnuts. Cook 3-4 minutes. Add the sauce, cook an additional 2-3 minutes or until the sauce thickens. Plate and garnish with green onion. Makes enough to serve 4. Each serving contains 120 calories, 1 gram of fat and .7 grams of fibre. Bet you that pre-made entrée doesn’t have great nutritionals like that! Absolutely great on steamed rice. My husband likes his orange chicken spicier so he added garlic chili sauce to his. Very nummy for those spicy folks out there. 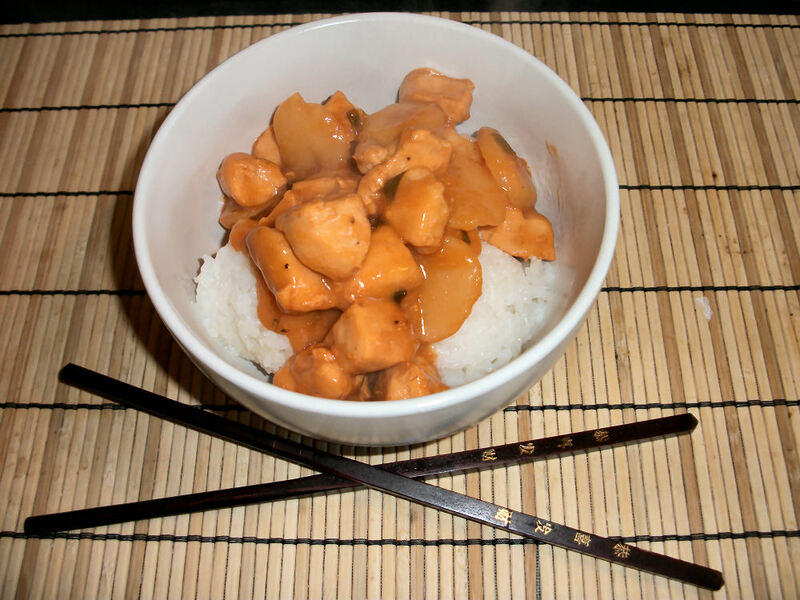 This entry was posted in Craving Buster, Dinner and tagged Chicken, Stirfry. Bookmark the permalink.